Smokecraft is one of those brands that seems to have been around forever. I found this particular "super size" bag at the Oberto Factory Store in Seattle, WA last November. At one point, Smokecraft was owned by International Multifoods Corporation, considered to be one of the "big three" foodmakers of the world. I'm not sure how long it was owned by them. But in 1986, the company sold the brand to Curtice Burns Foods, a foodmaker best known for the Birdseye brand. Curtice Burns later acquired the Lowrey's Meat Snack brand, and combined the two into Curtice Burns Meat Snacks. Then in 1994, Curtice Burns sold both Smokecraft and Lowrey's to Oberto Sausage Company, which overnight made Oberto the largest jerky manufacturer in the world. On this package is a sticker that says "ends and pieces". I'm wondering if this is Oberto's way of describing their rejected pieces. Beef, dextrose, water, flavorings, brown sugar, hydrolyzed beef stock, salt, hydrolyzed corn, soy, wheat protein, natural smoke flavoring, monosodium glutamate, sodium erythorbate, sodium nitrite. Note that these ingredients are very similar to Lowrey's Big Beef, except that this stuff contains "hydrolyzed beef stock". The tastes I pick up from the surface of these pieces is a smoky flavor and a salty flavor. In the chewing, I get just a bit more salty flavor, a stronger smoky flavor, and that's it. After having eaten a few of these strips, the word that keeps coming to mind is "bland". There's just not much flavor in these things. Of what flavor I can find, it's largely a salty flavor, and some smokiness. I taste nothing else. I found one abberant strip that offered a disgusting taste resembling that of human blood. I found it while sucking off the surface flavors. If you've ever tasted your own blood, you know the taste I'm talking about. The aftertaste for most of these pieces, has a weaker version of that human blood taste. 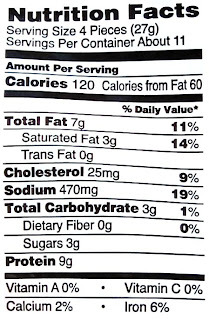 Some of the other things mentioned in the ingredients list, like "beef" and "brown sugar", are not to be identified at all. There's no taste of meat in this, and I can't really find anything sweet. However, after several pieces, I do get a slight black pepper aftertaste. After writing the above four paragraphs, I re-read my review of Lowrey's Big Beef - Hickory Smoked, to see if I had written the same thing, considering both Smokecraft and Lowrey's are made by the same company, and are both chopped & formed. Interestingly, I found that Lowrey's had a bit of a "beefy" taste, more similar to that of a meat stick. But with the Smokecraft brand, I can't say that at all. This has even less taste. The nutrition facts label depicted at the bottom of this article is also different than that of Lowrey's, but keep in mind that the Lowrey's label is for a 39g serving, while the Smokecraft is for a 27g serving. Kinda tough to compare. I'd say the dominant flavor of this jerky is a salty flavor, which itself is not really "too salty", probably low in salt intensity. The second dominant flavor is the smokiness. There is no third dominant flavor component that I can detect. 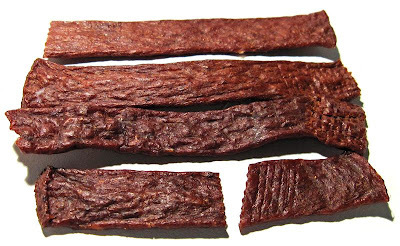 This a chopped & formed jerky, in widths of about 1/2 inch, and lengths of about 4 inches. The bag has a sticker on it that says "ends & pieces", and in fact I do find several smaller pieces in the bag. But most of the pieces are still full sized. There's a moderate level of moisture in these strips, but I tend to think it's more of a greasiness. My fingers do pick up a fine film of oil when handling these things. Note that the package is stamped, "Extra Tender". In truth, I don't see this jerky as being extra tender at all. It's not anymore tender than the Lowrey's Big Beef, and not anymore tender than most other chopped & formed jerky brands. 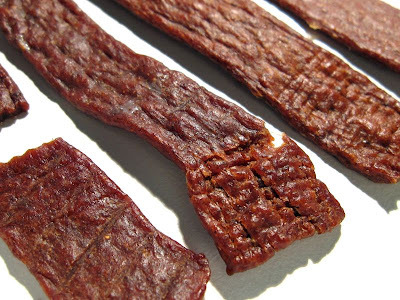 But it's still easy to bite off a piece, and easy to chew, as far as jerky is concerned. The chewing texture of these things don't provide any kind of steak-like experience, even after chewing a piece thoroughly. This stuff chews similarly to large streak of gristle. As I chew, it breaks up into smaller chunks, and each chew experiences a bit of rubbery, elastic feeling. Eventually it reduces down to a finer meal, but still doesn't resemble anything meat-like, more like tiny granules of gristle. As a chopped & formed jerky, I don't find any tiny flecks of bone, cartilage, or hoof. It appears to be all soft tissue in here. I paid $4.99 for this 10oz package at the Oh Boy! Oberto Factor Store in Seattle, WA. That works out to a price of $0.50 per ounce, making this a cheap buy. For general jerky snacking purposes, at this price, it's a fair value. I don't find much snackability in this actually. There's little taste in this stuff, and the chewing texture is bad. It's largely a fair value only because you're getting 10 ounces of stuff at 50 cents an ounce. But you'll likely only get that value from the Oberto Factory Store. Anywhere else will cost you more, and in that case it's a bad value. On the other hand, you might find yourself wasting money on this. I'm not sure anyone can tolerate all 10 ounces of this jerky, and like me you'll probably feed the rest to your dogs. I don't really find any snackability in this. I ate several pieces of this stuff only to do my due diligence in writing this review. First, there's very little taste in this to enjoy, and of what taste I got, it was just the salty and smoky flavors. And then there's that bad aftertaste. And to make things worse, the chewing texture is more like gristle than meat. Now I understand why when I do a Google search for "smokecraft jerky", I get so many listings for fundraisers. That's probably the only way you can sell this stuff. A good beer with this is probably anything that can mask the aftertaste.